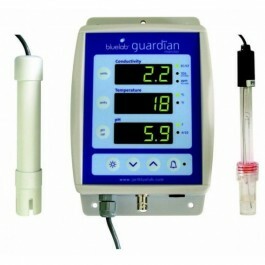 In just one glance it measures all three critical parameters for successful growth pH, conductivity and temperature. Large easy to read, Plant Safe green LED displays. Selectable values for conductivity and temperature. Simple push button pH calibration system. No calibration required for conductivity and temperature. Silent alarm for both high and low settings. Settings retained when power lost (non-volatile memory).